Traditional approaches to Quantitative Information Flow (QIF) represent the adversary’s prior knowledge of possible secret values as a single probability distribution. This representation may miss important structure. For instance, representing prior knowledge about passwords of a system’s users in this way overlooks the fact that many users generate passwords using some strategy. Knowledge of such strategies can help the adversary in guessing a secret, so ignoring them may underestimate the secret’s vulnerability. 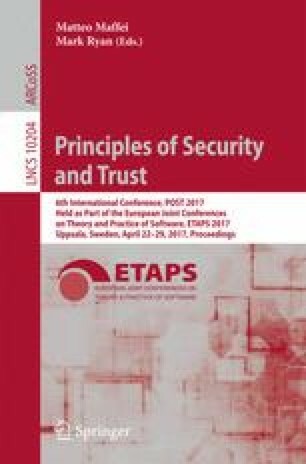 In this paper we explicitly model strategies as distributions on secrets, and generalize the representation of the adversary’s prior knowledge from a distribution on secrets to an environment, which is a distribution on strategies (and, thus, a distribution on distributions on secrets, called a hyper-distribution). By applying information-theoretic techniques to environments we derive several meaningful generalizations of the traditional approach to QIF. In particular, we disentangle the vulnerability of a secret from the vulnerability of the strategies that generate secrets, and thereby distinguish security by aggregation—which relies on the uncertainty over strategies—from security by strategy—which relies on the intrinsic uncertainty within a strategy. We also demonstrate that, in a precise way, no further generalization of prior knowledge (e.g., by using distributions of even higher order) is needed to soundly quantify the vulnerability of the secret. This work was developed with the support of CNPq, CAPES, FAPEMIG, US National Science Foundation grant CNS-1314857, and DARPA and the Air Force Research Laboratory, under agreement numbers FA8750-16-C-0022, FA8750-15-2-0104, and FA8750-15-2-0277. The U.S. Government is authorized to reproduce and distribute reprints for Governmental purposes not withstanding any copyright notation thereon. The views, opinions, and/or findings expressed are those of the author(s) and should not be interpreted as representing the official views or policies of DARPA, the Air Force Research Laboratory, or the U.S. Government.